Welcome to the Swine Barn! Decorate and prepare pens with sawdust. Give your pig a good bath before coming to the Fairgrounds. 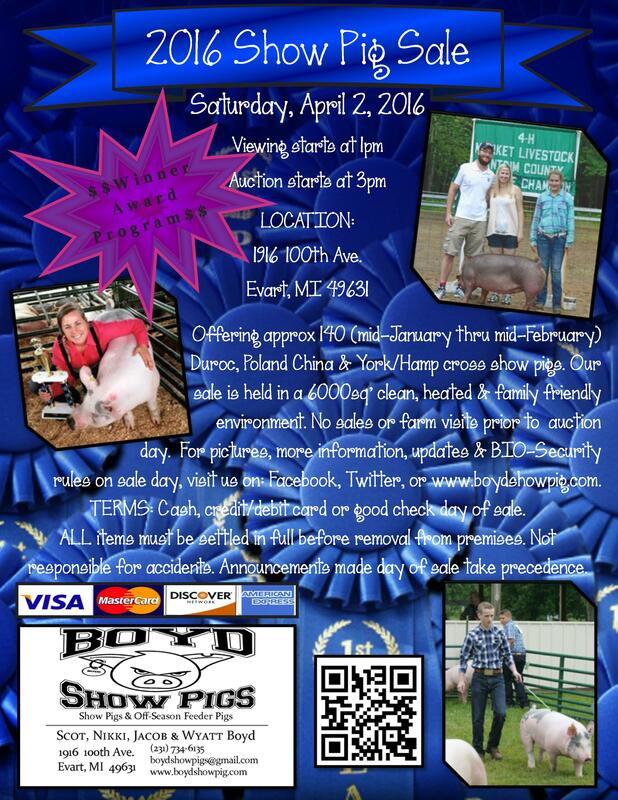 Bring your clean pig to the Fairgrounds. Ear tag must be CLEAN and readable. Your pig will be weighed when you unload. Jot down the weight and take your pig to its pen. Washing Pigs-Adult must be present. Green/White Market Card must be up in your pen. Please help us out, if you are on the grounds, parents, leaders, and 4-Her's. Back tags will be available in the back of the barn. work type boot or shoe. Know your class or division number. Monday is all about you and your knowledge of your project. Tuesday is all about your pig and how it will end up in the market. PARENTS/LEADERS - We need 2 - 3 volunteers from each club per show. CLEAN BARN AFTER SHOWS--it is everyone's responsibility. All clubs are responsible to help their club with pictures. Bring some treats and feed for your pigs. Collect your ribbons and wear club shirts. CLEAN BARN-after all pictures are taken. Sit in your pen in the evening and speak to potential buyers. Gather your ribbons and sell your pig. Remember to thank your buyer after you put your pig away. A small gift and thank you card can be given to your buyer. GREEN /WHITE MARKET CARD--add your buyer and price per lb. Sit in the arena and cheer on your friends. CLEAN BARN--after last pig is auctioned off. Leaders Only--You may pick up your trucking papers in the back of the barn. As you may be aware, the 4-H Species Chair and assistant and the Fair’s Superintendent of Swine and assistants spent many hours drafting a proposal. Two additional meetings were held - November 30 to elicit input from leaders, parents and 4-H members and on December 23 with 4-H staff. A wide range of ideas were suggested; thank you to those who attended and shared ideas. The 4-H Council leadership listened and is trying to accommodate as many viewpoints as possible. The goal is to limit the number of swine to the capacity of the swine barn in the most fair and equitable way possible. 4-H is all about learning and responsibility. Thus we have decided to strengthen the learning experience for 4-H members. v The registration deadline for 4-H swine is the 4-H Livestock Council meeting in February (2/11/2019). Ø OR handed to a 4-H staff at the February 11 Livestock Council meeting. Ø Registrations may be submitted to 4-H staff prior to the February 11 deadline; early registration is encouraged. Ø No swine registrations will be accepted after the February 11.
v There are two new 4-H swine registration forms --- one for individual members and one for the 4-H club; see attached. Both forms must be submitted by the deadline above. The forms will be posted on the 4-H Livestock Council website as well as the Animal Science page of theGrand Traverse County 4-H and Leelanau County 4-H websites in early January. v Space in the swine barn is at a premium - there are only 193 pens thus it is essential that whenever possible each pen house 2 pigs. Pigs that are raised on the same property will be housed together at the fair. On the 4-H club registration form (mentioned above), 4-H members must identify what pigs are being housed together. Note that at home the pigs do not need to be housed in the same pen but must be in pens next to or very near each other. v Ear tagging of all 4-H swine will be handled differently in 2019. A team will be stationed at the NWM fairgrounds on two dates in May ( Saturday, May 4th from 8:00 a.m. to 12:00 p.m and May 7th from 5 p.m to 8p.m. All 4-H swine must be ear tagged on one of these two dates. v This year 4-H’ers are allowed to tag and raise a second pig ($10 fee for second tag which must be paid on tagging day); all the members in that immediate family can choose and bring the best pigs to the fair. v If a pig becomes sick or dies, it may be possible to replace it; the deadline for replacements is May 31. Members should contact their club leader who should contact the swine Species Chair for approval of the replacement. v All swine members are required to attend a minimum of 2 additional 4-H swine-related learning opportunity prior to June 1. Several opportunities will be offered locally; a list of qualifying opportunities will be available in late-January. Must attend at least 1 general education meeting and 1 swine specific education. The Hannah Bollinger feed rep will be Available Thursday April 4th 6:00 p.m. at Reedemer Luthern Church in Interlochlen,MI. Space is limited you will have to sign up. Another choice is Saturday June 1st at Halls feed mill on north long lake road. v Acceptable swine market weight is 225-315lbs. Members who have swine that weigh less than 225 pounds or more than 315 pounds at weigh-in on Saturday will still participate in the appropriate 4-H showmanship class, however they will not participate in 4-H market classes, the 4-H auction and the animals cannot be sold by private treaty. The member will be expected to remove the animal from the fairgrounds at the end of fair week. v Refer to the current 4-H Livestock Guidebook for additional requirements regarding member’s age, animal’s age, possession date, vaccination, swine health record, replacements, worming, showmanship, clothing, etc. The new requirements outlined here will be incorporated into the Guidebook this month and the updated version will be posted by February 1. ​*Cold Weather - Keep your pig comfortable and healthy by making sure it stays warm. If you are able, hang a heat lamp and put up a thermometer in your barn. You can also use an electric heater. Make sure bedding is always dry. *Swine Health Record - *** New this year *** your vaccinations must be completed by May 30. The signed Health Record is required when you bring your pig to fair. Ask your breeder if they vaccinate for Circovirus, Influenza, Erysipelas, and Mycoplasma. *Worming - You need to worm your pig twice before you come to fair. Memorial Day and July 4th are good dates to follow. *Work Bees - All 4-Her's marketing an animal must complete a 2 hour Work Bee at the Fairgrounds. Make sure you sign in and out to receive credit. Please come prepared with your own tools (rakes, shovels, tarps, wheelbarrows.) Dates are posted on the home page. *Volunteers - We can always use an extra hand with something. During Fair Week, sign up sheets will be posted in the barn and contact Kim or Jodie to help. Click on Show Community, then resources.